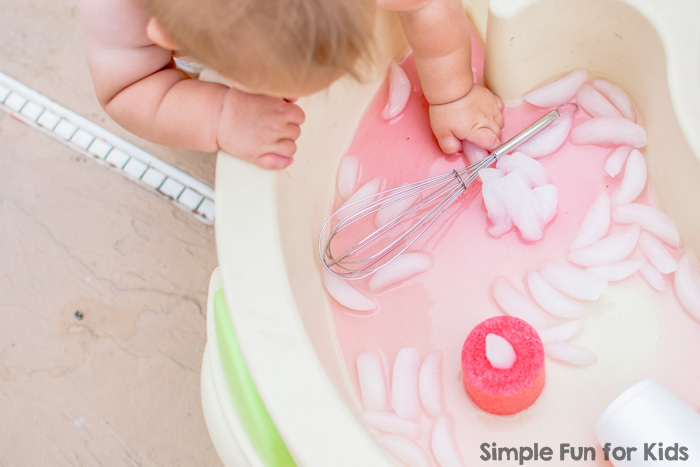 It’s hot around here, and we spend a lot of time with water play and sensory soups. I’ve only discovered sensory soups recently, and I’m in love with them! Not only are they easy to set up and a perfect summer outdoor activity, they also work great as activities that both of my kids can participate in at the same time, despite their age difference. While E is usually quite patient with her baby brother, there are still situations almost every day where she complains that he “bothers” her or interferes in her play. 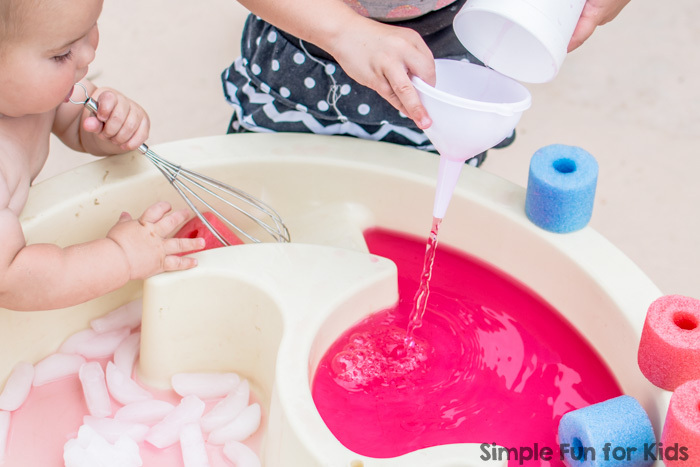 This has never been an issue when I set up the water table with a sensory soup that’s both baby-safe and interesting for a preschooler. 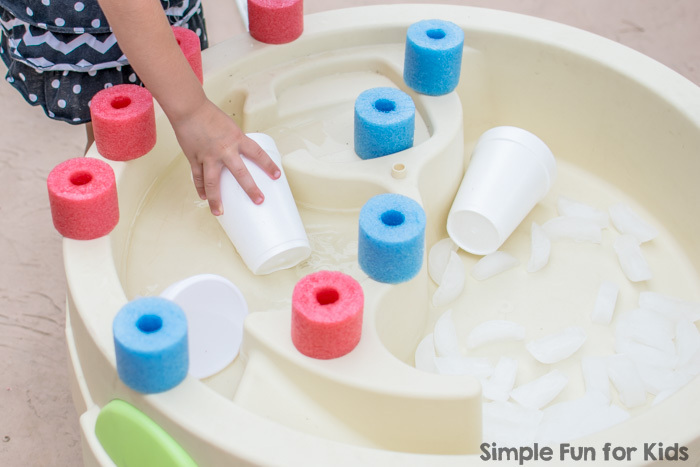 Besides the variety of ways in which they can interact with the materials, the size of the water table certainly also helps with this. (E was 4 years and 7 months old. 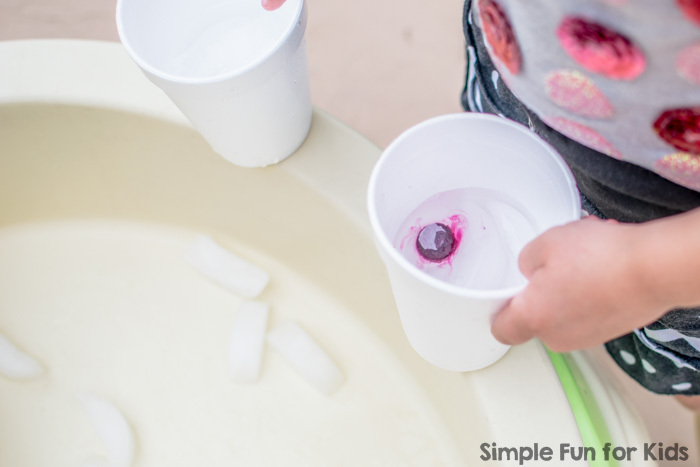 This activity was originally simply supposed to be N’s first experience with ice, so I put some water in one compartment of the water table, and ice in the other. He was busy in the sandbox, though, and didn’t even look up, but E came right over to see what I was doing. 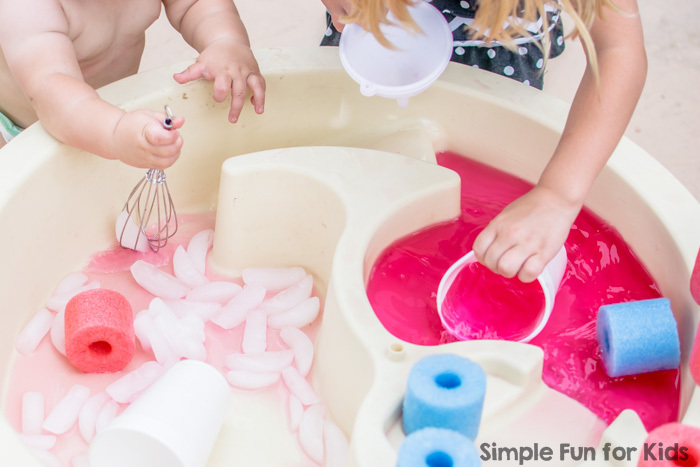 So I decided to throw in a few more items for her and basically ended up using the stuff from the Red, White, and Blue Water Sensory Bin plus a few extra cups and a whisk. I put the pool noodle slices into the water, and the first thing E did was take them all out and set them on the edge to get access to the water with her cup. 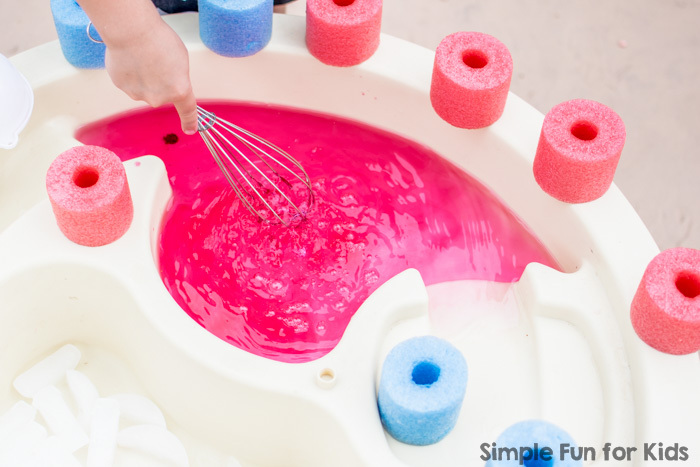 She started cooking a very interesting concoction with a lot of ingredients with exotic sounding names but decided that she needed fizzy tub colors to make it just right. 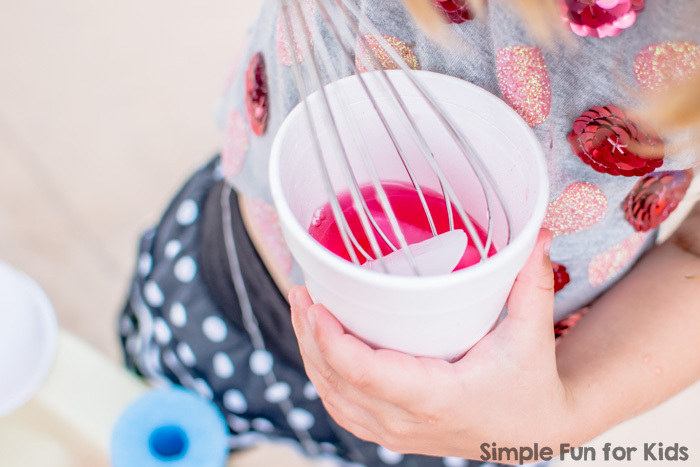 The whisk is always the most important tool for E’s sensory soups! He was interested in the ice cubes but never held on to them long before doing something else, then came back to them several times. E let him have the whisk and demonstrated the funnel for him. Suddenly, E said she’d be right back and ran into the house. She came back with some measuring spoons and explained that she needed them to mix a drink for me. 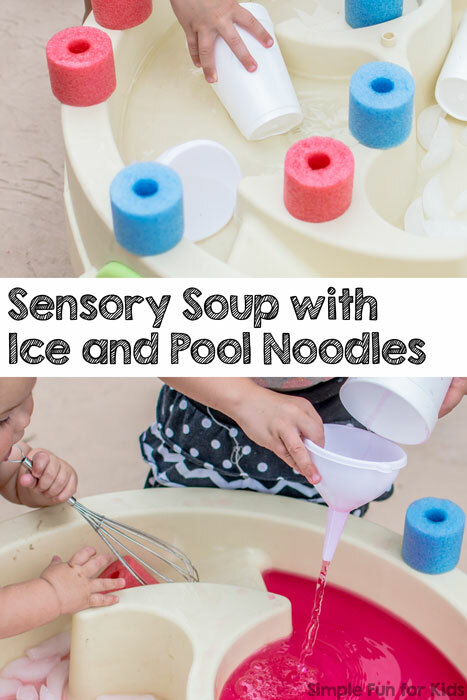 Both E and N really enjoyed this sensory soup with ice and pool noodles in their own ways. We got 30 minutes of play from an activity that only took about 2 minutes to set up! Have you tried sensory soups? What’s your favorite tip for allowing kids of different ages to play together? Leave a comment below! 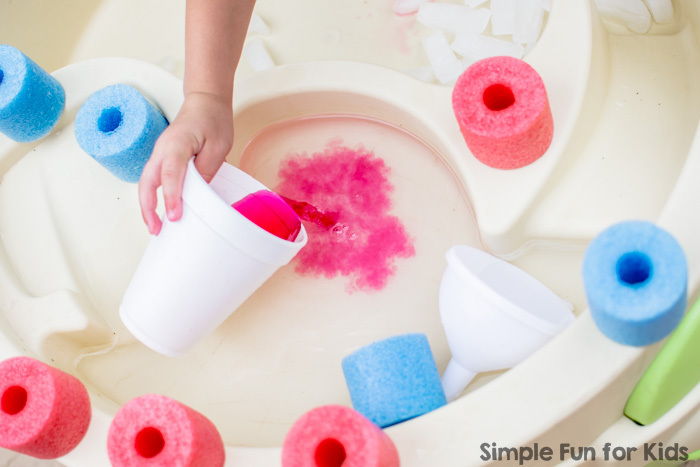 Are you interested in other water play activities?